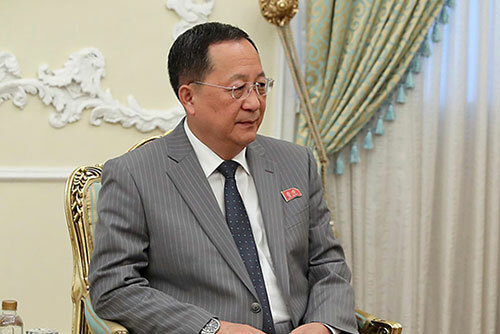 North Korean Foreign Minister Ri Yong-ho says that although his country agreed to dismantle its nuclear program, it will preserve its nuclear technology as the U.S. may not drop its hostility towards the regime. Ri made the remarks on Thursday during a meeting with Iranian Parliament Speaker Ali Larijani in Tehran. The minister reportedly told Larijani that dealing with Americans is difficult, saying that the U.S. needs to abide by its commitments in order to achieve the goal of complete denuclearization of the Korean Peninsula, but it refuses to do so. Ri added that although his country has agreed on disarmament to deliver on its commitments in negotiations with Washington, it will not surrender its nuclear technology as it claims that the Americans will not abandon their hostility toward the North. Larijani warned against Washington’s lack of commitment to its international agreements. He said that Iran has had experience negotiating with the U.S. and in all previous cases, the Americans’ commitments were explicitly stipulated in the agreements but they have never kept their word.